Your sweet adorable kitty just won’t stop destroying your furniture! 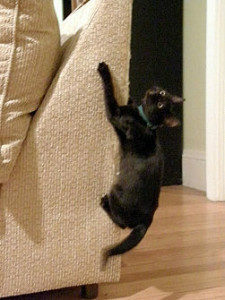 It is so frustrating to see your cat scratch at your couches despite your efforts to make them stop. What we must first recognize is that the act of scratching, like the act of bathing himself, is instinctual to a cat. While scratching cannot be eliminated completely, there are some tips to help redirect your cat’s scratching to an acceptable object. To move a cat’s attention to a cat scratch post and save your furniture, you will need to deter them from scratching the furniture. You can do this by covering the places your cat is attracted to with double sided tape; your cat will not like the feeling of the tape on its paws and move away. There are also sprays on the market that will change the scent your cat leaves behind that tells him to come back and scratch at the same spot again. It is almost on the same line as marking; your couch corner is where your cat has deposited the outer layers of his nails. The best thing to do is to make a cat-friendly scratch zone in your house with cat scratch posts. Most cat scratch pads come with cat nip as a way to entice the cat to use the product. This is a great way to get your cat interested in its new toy. Be sure to have patience. Whether feline or human, behavior change takes time. Your furniture will soon be relieved from cat scratching after you deter your cat from the area, and distract it with new toys.